This event had so much entertainment for the crowded first & second levels of, The Sphinx on K. Leading up to the main fight between Gerome “GQ” Quigley, 16-0-0 (KO15) and Luis “La Roca” Hernandez 16-4-0 (K09) from Puerto Rico. There were 10 boxing matches with 6 undercard features, Sam Crossed, Luther Smith, Leo Alcaneral, Rashad Kilpatrick, Jason Bell, and Justin Bell. The ring announcer, “Henry “Discombobulating” Jones was keeping the audience’s attention by presenting not only the boxers, but other entertainment happenings in the ring such as, a young boy, Noah. He entertained the crowd inside of the ring with his talented dancing around the ropes in precise movements to the beat. Little did Jones know that he would be surprised in front of the spectators when he received a glass trophy by Cat Taylor whom I referred to her as the “Feather Lady.” She was dressed in a angel costume. Her beautiful presence on the ring had the crowd curious to know “who is this lady?” Well, let me tell you. She is one of Gerome Quigley’s biggest & dedicated fans cheering him on throughout his boxing career. Her personality was vibrant! She continued her surprises with giving Gerome Quigley’s parents (his father is also his manager, Jeff Gatling.) a glass trophy. These are special moments you rarely see with fans. The hype during the matches from the audience was filled with excitement when each boxer came out pumped with the music jammin’ in the background by DJ Young Music. This set the right tone for the boxers to come out strong and ready to fight their opponent. The confidence showed on their face and with their body language. A few boxers came in the ring lacking confidence that was needed to drive them towards a successful fight. GQ entered the ring area as the music played with his boxing mates holding up his Championship belts he won from previous fights. He was wearing a long gold, white, and black robe hanging to his feet and the hooded robe covered his head. The back of his robe stated, “Gerome Quigley.” Followed behind GQ as he made his way to the ring was Floyd Seymour, Donnell Miller, and his manager, Jeff Gatling. As soon as GQ entered into the ring, he jogged around the rope and went back to his corner to get pumped up for the fight. He was jumping to loosen up. GQ was ready to fight. This was the moment the crowd has been anxious to watch. GQ & La Roca had an intensive and competitive fight that kept the crowd on the tip of their toes not knowing the outcome at the end. This was a tough fight for the both of them, but at the end of the match, there was only one fighter walking away with the Championship Belt. 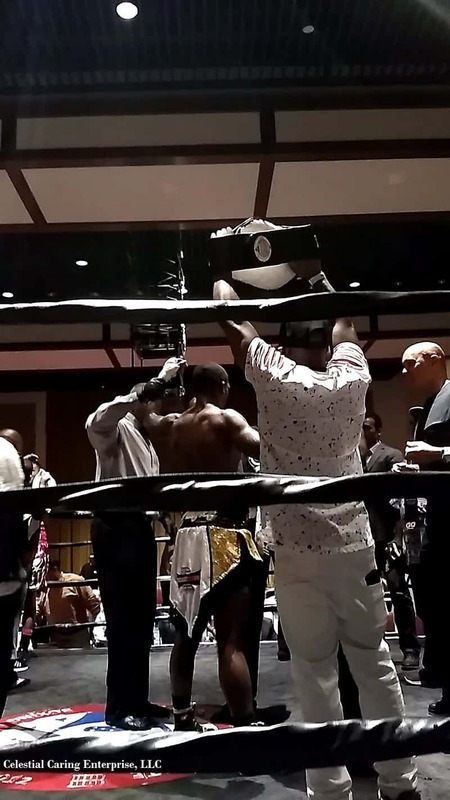 Once again, Gerome “GQ” Quigley continued to show the world why he is the undefeated USBO Welterweight Champion. GQ defeated his opponent, Luis “La Roca” Hernandez with an ability to endure one of the best challenging fights. GQ passed the test and won the victory! Now he continues to train for his next fight.